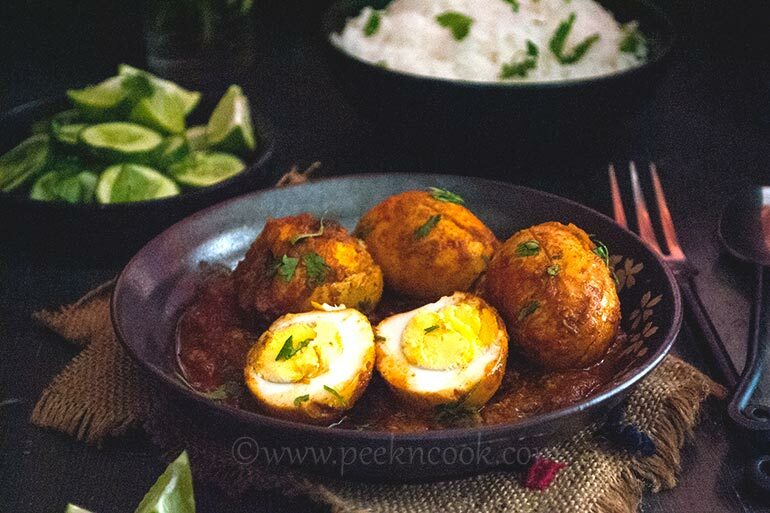 Dimer kosha is a popular Bengali style spicy oily Egg curry, very much different from the regular Dimer Dalna. Dimer Dalna or Dimer jhol is light runny curry with boiled egg while Kosha means bhuna or slowly cooked oil based spices which should be thicker than the normal curry. This Dimer Kosha is used to cook in Bengali household for special treats, or on guests arrival. In Kosha we use onion paste and thinly sliced onion, little bit extra oil than and little bit more chilies the regular curry. And in Kosha oil must be floating on the spices. This can be cooked with Poultry or Country eggs, but for best results you should use Duck Eggs. The duck eggs has a strong eggy smell in it, and goes best with this recipe. This dish must be cooked in mustard oil, otherwise you can't get the pungent rich taste of this dish. Dimer kosha is a popular Bengali style spicy oily Egg curry, very much different from the rgular Dimer Dalna. Dimer Dalna or Dimer jhol is light runny curry with boiled egg while Kosha means bhuna or slowly cooked oil based spices which should be thicker than the normal curry. Take the eggs and boil them with some salt to make hard boiled eggs. Peel them and slightly slit on the white part to prevent bursting while frying. Now marinate the eggs with 1/2 teaspoon turmeric and salt, rub on the eggs and keep aside. Now heat 1 tablespoon oil in a pan, and add the eggs, fry them till they turn to red in color. Don't over fry them, the skin of the eggs will be chewy. Now add rest 2 tablespoons mustard oil and heat till the oil becomes smokey. Now temper the oil with bay leaf. Add the finely chopped green chili & onion. Add little salt and sugar and fry them till the onion looks slightly brown in color. Keep the flame on lower mode, the Kosha or bhuna must be slowly on simmer. Add onion paste and keep stirring, sprinkle some water to prevent the onion to get burnt. Once the onion paste looks light brown, add the ginger and garlic paste one by one. Keep stirring. Take a small bowl, add turmeric, red chili & cumin powder, add 1 tablespoon water and make a paste. Add this to the pan and keep stirring on low flame. After few seconds you will see the oil has started oozing from the masala. Now add the tomato paste or grated tomato. Again keep stirring till the raw smell of tomato goes off. Once the tomato is cooked enough and the smell goes off, add salt as per need and the fried egg. Keep coating the eggs with the masala gently for a minute. Now add 1/2 cup warm water and cover the pan for 2 to 3 minutes and let the eggs to absorb the masala nicely. After 2/3 minutes, open the lid and higher the flame to dried up the gravy. Sprinkle the garam masala powder. Turn off the flame and cover the pan for 10 minutes before serve. Serve Dim Kosha with hot steamed rice, roti, paratha or puri. Cilantro is optional, if you like the flavor may add. The whole process must be cooked on low flame, and very slowly.